NSGIC, and spatial thinking in general, are hard habits to break. For those interested in building meaningful state and national digital mapping resources, the camaraderie and synergy of NSGIC conferences, committees, and professional networking is hard to beat. But, if you’re like me, very occasionally you find yourself engaged in some weird (to others) NSGIC or geography-inspired activity even when trying to get away from it all. This happened on a road trip to southern Utah and northern Arizona last week. 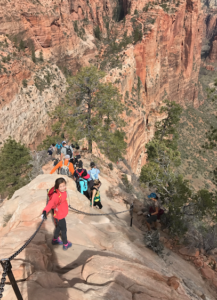 On day 2 of our spring break trip, my family suddenly found ourselves playing a modified version on the license plate game while hiking Zion National Park’s Angels Landing trail with, oh, about 1000 or more of our fellow park goers. 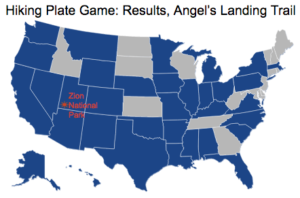 In our modified version, “the hiking plate game,’ we were looking for any specific mention of a state or strong association to a state (a place, university, pro sports team, etc) on the clothing of passers by. 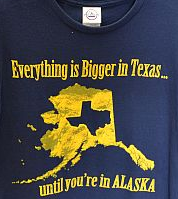 We were working together toward fifty (and DC) and we only allowed one state to be counted per person. There’s something about Zion, which had almost 4.3 million visitors last year, because our other hikes were not nearly as productive in the hiking plate game. A 3 hour hike on the Bryce Canyon NP Peekaboo Loop trail (photo) produced only 5 states. Smaller crowds and snow on the trails (Bryce is about a mile higher) no doubt contributed to the lower state count as did, we feel, a much lower propensity of Bryce’s visitors to wear logo’d attire. Happy spring and, in this new season, feel free to embrace your inner NSGIC/GIS/mapping instincts…unless a tattoo parlor is involved, in which case, you might sleep on it for at least a night.